It’s official. I’m back and the Alaska chapter has concluded. It was a little quicker than anticipated. There was a week of fishing left, but I wanted to get back to the city to take some classes. I have been putting more pictures on my flickr page, as internet connection is a lot better here. So check them out! 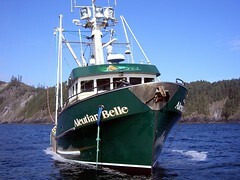 Here is a picture of the Aleutian Belle, my home while in Alaska. I will be taking some programming courses (PHP and Ruby on Rails) and a course on owning and operating a small business. I will be playing the part of a student for a little while and will try to catch up on surfing, cycling, climbing, and other activities that I live for. Thanks for stopping in and I hope to see you soon.